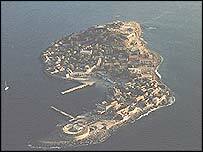 Goree Island is on the great western bulge of Africa - the nearest point on the continent to the Americas. Millions have passed through the island and other similar trading posts to work in the plantations of the New World, including America. The shipping of slaves from Goree lasted from 1536 when the Portuguese launched the slave trade to the time the French halted it 312 years later. The island is just 3 km off the Senegalese coast, and its tiny size made it easy for merchants to control their captives. The surrounding waters are so deep that any attempt at escaping would mean sure drowning. With a five kg metal ball permanently attached to their feet or necks, a captured African would know what jumping into the deep sea would bring. 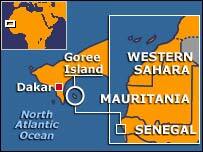 In 1978 Unesco designated Goree as a World Heritage site. Today modern cargo ships go past the island, on their way to and from Dakar's harbour. The island, with some 1,300 inhabitants is said to be so tranquil that there are no cars, no crime, and those who visit Goree are said to behave more like pilgrims visiting a holy shrine than as tourists. Most visitors don't even spend the night on Goree. There is only one hotel. During his visit to Goree in 1981, the former French prime minister, Michel Rocard, said, "It is not easy for a white man, in all honesty, to visit this Slave House without feeling ill-at-ease". The Pope also visited Goree in 1992 and asked for forgiveness because historians say that a lot of Catholic missionaries were involved in the slave trade. 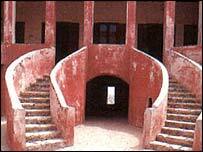 The slave house at Goree has also been visited by South African President Nelson Mandela. He toured the island three years before his election, and insisted on crawling into a cramped holding cell. The visit there by George Bush lasts just 20 minutes. But the images beamed home are intended to send a powerful message to black electors who could well help decide the next American presidential election. His predecessor, Bill Clinton, also visited the island in 1998. Has Bush visit made a difference?